Live from Swaziland ... it's Saturday morning! : Who cares? I cannot tell you how encouraging it is to me to receive your kind comments, emails and words of encouragement each week. It shows me that YOU CARE, and you care very much. This week I am going to give you a few fun updates on things that I know you care about. · We have 157 children under 7-years old. · Our two severely underweight babies are doing great! Peace (who arrived 4-weeks-old weighing 3.7 pounds is now a whopping 7.5 pounds at 10-weeks-old). Baby Amanda arrived as a newborn at 5 pounds and at 6-weeks-old is 8-pounds. Both are healthy and happy. · We expect another baby girl to arrive early next week. Stay tuned. We are still very much in need of monthly donors to help us care for these children. 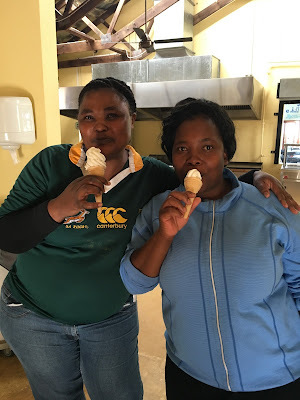 · On April 29th I posted a blog asking “How much is too much?” (http://janinemaxwell.blogspot.com/2017/04/how-much-is-too-much.html) It was regarding whether or not we should splurge and buy a soft ice cream machine for our children. Many of your sent me resounding words of encouragement AND put your money where your mouth is. Within days, we had the funds to buy the machine and it arrived this week! · What I didn't know about getting the ice cream machine was the sheer joy that would come to the staff, volunteers and our favorite Gogo when she had ice cream for the first time in her life! 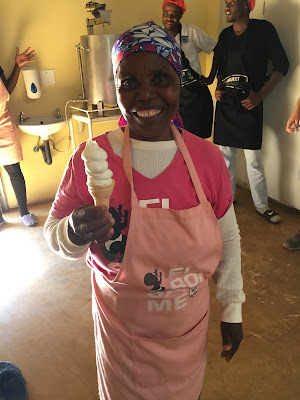 63-year-old, Gogo Mona Lisa, giggled like a school-girl (even though she never went to school) when she received her very fist ice cream cone, and her joy was beyond anything that I had expected. Thank you all who made this possible. Sr. Supervisors Welile and Khosi enjoy the first batch of soft ice cream. · Our goal is to collect 146,000 diapers, which should last us a whole year. · Our goal is to collect 584,000 wipes, which should last us a whole year. · 300 friends of Heart for Africa have already purchased 96,000 diapers and 315,00 wipes to date! We still have a ways to go before the container ships at the end of June, so please go to our Baby Registry Amazon accounts today and help us reach our goal. When you shop on those registries, the diapers are shipped directly to our warehouses in Canada or the US. It’s just SO easy. · We have started the system by putting ammonia in to the water. Nitrates and nitrites are registering, which means that there is bacterial growth (which is a good thing). · The first nine trays of lettuce seeds (1,100 plants) have been planted and have started to sprout. This week Jonathan Marsh is heading to Colorado for an intense training course with our partners from EMERGE Aquaponics. When he returns we will work on the next stage of the process. · We are all really excited about the growing potential of this innovative initiative. There are so many moving parts here at Project Canaan. I will confess that I am pretty tired at the end of each day, but my head is spinning at 3AM with thoughts, ideas and prayer for the day ahead. I am thankful that the Lord continues to give us “one page at a time”, and that each new chapter is more exciting than the next. Live from Swaziland… looking forward to Sunday, and a day of rest. When a wave of sadness hits. That's a load of 💩!